Cafe Aman will perform songs in Greek on Monday night. Greek and Armenian music will enchant music lovers at Istanbul Metropolitan Municipality's (İBB) Cemal Reşit Rey (CRR) Concert Hall. The İBB announced that "Cafe Aman," the music band consisting of Greek and Turkish musicians, will perform on Jan. 28 at the CRR Concert Hall as part of a program titled "Turkish, Greek Songs on Istanbul." Stelyo Berber is the art director of the concert, while the arrangements of the pieces were done by Manolis Kottoros. Consisting of two sections, the concert will present a number of popular pieces, including "Darıldın mı Gülüm Bana," "Hariklaki," "Cevriye Hanım," "Manolyam" and "Vospoporos." Presenting Pelin Suer and Stelyo Berber as the soloists, the group also features Vasilis Kasouras on bouzouki and oud, Moanlis Kottorso on violin, Aydın Çıracıoğlu on accordion, Bora Çeliker on guitar, Umut Sel on contrabass, Mert Demircioğlu on qanun and Ozan Şakir Uygan on percussion. 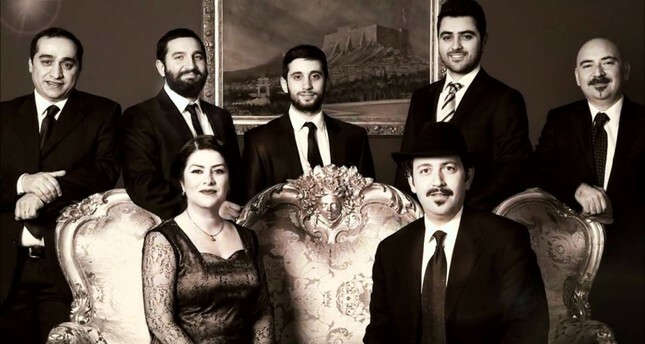 The band, Cafe Aman was founded by Stelyo Berberis and his wife Pelin Suer in 2009. In addition to rebetiko, they study Byzantine music, Ottoman fasıl music and Turkish classical music. Following the "Turkish, Greek Songs on Istanbul," concert the CRR stage will host a performance of Armenian composers on Jan. 29. Organized by Aşiyan Musiki Derneği (Aşiyan Music Association), the concert will be conducted by maestro Sadık Kavas. They will perform songs by Armenian composers, like Hamacıyan Effendi, Mardik Effendi, Garbis Agopyan, Hanende Sarı Onnik, Kirkor Civanyan, Sami (Samuel) Hazinses, Notacı Kapriyel Ebeyan and Udi Kirkor Mehteryan. Consisting of two sections, the concert will start with the performance of Aşiyan Music Association and will continue with guest singer Elif Güreşçi's performance.